The reduction of carbon dioxide has gained much attention due to increasing environmental concerns about global warming associated with carbon emissions from industrial effluents and public transport etc. 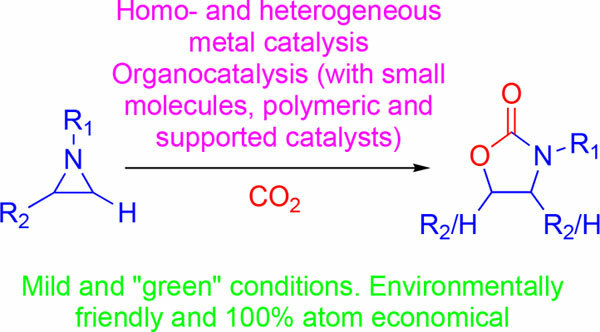 In this regard, considerable attention has been devoted to the chemical conversion of carbon dioxide, and its incorporation into synthetic organic molecules under mild and “green” conditions. In recent years, significant effort has been dedicated to studying the fixation of carbon dioxide with aziridines to afford oxazolidinones, which is an environmental friendly and atom economical process. In this review, we discuss the efficiency of different catalytic systems, by comparing and analyzing each reaction parameter such as pressure, temperature, substrate scope and product selectivity. Carbon dioxide, oxazolidinones, aziridines, metal catalysis, organocatalysis, homogenous catalyst.